I think we've had a demo on this topic before, but I can't find it, and a friend sent me this video so I thought I'd pass it along. I'm off now to try it! I do not have a flat surface to fold anything on. I fold em as I take them off the clothesline. For the most part - reasonable. My solution is to never do any of the inn's laundry. That's DH's job and it's one area where I don't poke my opinionated nose in it. If I did, I'd end up doing it! I have the best method - I hand them off to someone else to fold. You don't want to see my sorry, balled up attempts. I like folds on my sheets anyway, I really do and I think other people do! Do you remember the gal with the burns on much of her body in tears telling me how she slept for the first time ever in the comphy sheets, and have had a few since then mention that as well. Well, I am pretty much a cotton picker, I mean I love cotton sheets, vs poly, but at the cabin this week they have a laundry service for the linens and I swear I WAS SLEEPING ON SAND PAPER! I could only imagine if I got a really bad sunburn how awful it would have been, it was bad enough as it was. I have never slept on sheets that literally rub you the wrong way! I thought about this burn victim and how she must travel with her own sheets, now comphy brand. You don't, you try and iron them a few times, get very fed-up with them, throw them out and go and buy flat sheets. Maybe you should be practicing your "nurses corners" instead. After I posted this I went off to one of the bedrooms and tried this method. I do neat corners like this, but I can't follow this method at all. I just tuck the side under the mattress and then pull the sheet from the bottom of the bed round the corner and tuck. I end up with a neat fold, but it goes the other way to this. I use fitted bottom sheets (and yes, I know how to fold them perfectly.) But I use hospital corners for the top sheets. Works best if you have enough fabric, of course. Lay the sheet on the bed. At the bottom right, lift the mattress slightly and pull the bottom of the sheet towards the top. Repeat on the bottom left. About 15cm from the bottom, fold the sheet back onto the top of the bed. It will create a triangular piece that hangs down. 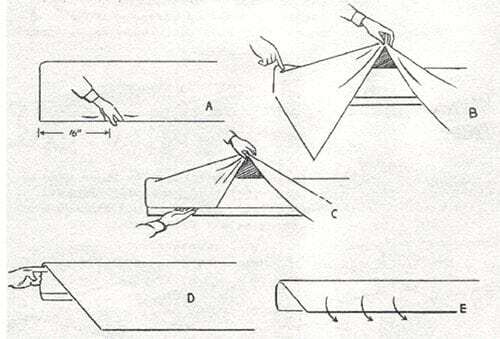 Fold this in. Then pull that piece back and tuck in the rest of the side. That creates a hospital corner. Now, here is the cheat... if you have someone who's a sheet puller, there is a way to actually curtail this. Before you make the hospital corner, tie a loose knot in the corner and tuck in the knot as part of the hospital corner. The mattress will hold the sheet in and they likely won't pull hard enough to pull the corner out. End of tug-of-war at night and one person ending up with no covers.